What is your primary sound system for music/TV/games and whatnot in your house? It's a Technics SA-EX140 which is 100 watts per channel. Very nice for a receiver, never had a remote for it though but it's not a big deal as I'm less than 3 feet away from it while listening to my speakers. Everything works and my relative who passed away is the one who bought it new and he was blind. Kept it in great condition as did I. The only issue with it - a spider's leg broke off in front of the display and you can kind of see it when it's turned on. No idea how it got there because it wasn't there when I first got it and I'd have to take the whole thing apart to get it out of there. Sorry about that shake on the last one, it looked like it came out fine when I took it but eh. This Luxman is nice and it has this strange old smell. It's sort of like a hot dust smell but it made my entire room smell like it. It's different but I kind of like it. All this old audio equipment has a smell like that I've noticed. This is a nice turntable. It has big thick spring loaded feet that let it move without shaking the whole thing. Has a very nice arm on it and I even have a new cartridge for it whenever the one it has breaks. Really is true what they say a lot of the times, they don't make things like this no more! It has lots of nice features, it reads the CD and can determine exactly how long the entire CD playtime is as well as the number of tracks, fast/slow speed fast forward and rewind toggle switch as well as a ton of other nice features that I don't even use! Polk Audio R50s. These are very nice speakers. They have the spikes on the bottom to isolate them from the carpet and give cleaner sound. I believe they are 150 watts per speaker max. The Luxman is 70 watts per channel and the Adcom is 80 watts high current so both are adequate considering my small room size. The Adcom has much more linear volume, however the Adcom has a polarized plug and due to the age of the Luxman it can't be plugged into the back of it and the Adcom makes the speakers make a pop when they turn on which I don't like. I'm not hooking the Adcom up until I have a newer pre-amp that it can filter through. The Luxman has a very decent amplifier built in even though I only bought it for the pre-amp. Now my question to you all, how much do you think I paid for each item? I'd just like to know what you'd guess and I'll tell you what I actually paid for each item. is that a turn table??? Hey I love turntables! Not to mention they're one of the cheapest mediums to get ahold of. I bought a stack of about 50 pretty good records for like $10 and some of them are four records in one album case. I have several double albums too. Right, wasn't sure since this isn't related to Riviera audio where it should go. Still, that thread was more about Bose. I actually had a question at the beginning which was my intention for this thread - the thread where everyone listed what they listen to music and whatnot on when they're at home. This is from the 1970's and 80's but still sounds better than most stuff you can buy today. Sounds pretty nice. Wouldn't say I totally agree with that statement though, the more esoteric stuff now is insanely nice. Your normal audio equipment from the 80's and 90's is pretty nice but the stuff nowadays like the cheapo Sony receivers is a far cry of the quality stuff used to have. Hell, I've picked up Sony receivers that felt light as a feather. This Adcom I have is pretty damn hefty and the Luxman is right up there with it. Even the turntable is big and heavy. sburch was saying his esoteric stuff from the '70s is better than half the stuff you can buy now. I think he's right. Like you said, there's a lot of cheap gear out there now. I don't know, some audiophiles seem to think those old tube powered amps and whatnot are the best. I don't. They color the sound too much. I want a neutral and completely accurate reproduction of sound, not anything that will color it and make it warm or biased in any other fashion. Stuff from the 70's isn't all that great though. I will say the 80's seemed to be the hayday of audio equipment. I have seen a lot of nice equipment from the 80's but everything I've seen from the 70's - save my Pioneer turntable and Luxman integrated amp - is old and not working. Commonly I see the old stuff at Goodwill and everytime I look at it there's knobs missing, stuff broke off, you plug it in and only half the display lights up and it looks in generally shoddy condition. Admittedly, something that was well taken care of might still be comparable to newer equipment but a lot of it is in poor shape. If any of it has a problem you can't find parts for most of them either and I surely wouldn't want to try and repair an old piece of audio equipment. Not to mention, the old stuff has very few inputs on the pre-amps (This Luxman while being nice has a Tape, Phono, Tuner and Aux) which make them not very versatile compared to newer equipment. I can't ever have a real tuner with this integrated amp, I have to use the Tuner for my CD player and the Aux is for my TV. The Technics was decent, but it had a CD, VCR (I used for TV), Tape, Tuner and Phono inputs. Pioneer, linear tracking. Packed up in my back room never use it. Bought it at the PX in Italy when I was in the Army. Don't think they sold this model in the US, B & O sued them for stealing the tracking design and they had to quit manufacturing. One day I will pull it out and post a photo. Well, like most any product, technological progress makes the quality get better. The stuff being made now is superior to the '90s, '80s, etc. But the fundamentals of amp and speaker design have not changed in over 50 years, so the companies you're speaking of, who make the good gear: Krell, Adcom, Pioneer, Marantz, Carver... they made good gear in the '70s, too. It's generally not as good as the stuff they're making now, but it's still better than a lot of the consumer level components you can buy nowadays. A few of the good names did things right back then, and a some of their vintage gear is now regarded as classic. While technically not the most powerful or lowest distortion amplifiers, they represented the pinnacle of Hi-Fi back in the '60s, and amazingly, they will still crank out the dynamics of today's music with ease. There are several of the originals floating around. Like a classic Corvette, they are highly prized and hold their value well, but they aren't out of reach price-wise, if a good system is important to you. The reason there was such a "boom" in hi-fi (electronics in general) was the development of solid state electronics near the end of the 70's. The reason tube amplifiers are touted so highly among audiophiles IS because of the slight coloring... just a hint of soft distortion coupled with the gentle roll off of high frequencies gives tube amps a "warm" sound. While agree that the newest electronics give the "purest" sound, that may or may not be what "sounds best" to some ears. AA, that macintosh amp is beautiful. Shintsu, if you want to hear some crystalline sounds, try to find a pair of electrostatic (flat panel) speakers. They're similar in style to a Ribbon speaker. They have a very smooth sound. They're great for midrange rich music like Jazz. I've heard some Magnepans but they can't take any bass (I almost bought them instead of my first speakers which were KLH T-5 Mains similar to these Polk's in design). I have also listened to an excellent pair of Martin Logan speakers at the high-end Best Buy in the area. Perhaps I'm confusing speakers here, but this makes me think of a certain pair of speakers made in the 80's that were about 7-8 feet tall and wide at the bottom and narrowing at the top. They were thin like DCM Time Frames. I just remember the ad picture which I think had a lady standing next to them and being amazed at how tall they were. I was actually at one point very close to getting a pair of DCM Time Windows. They were a little overpriced for the condition they were in and the guy wasn't willing to budge on the price and he was far away so the opportunity was scrapped. Yeah, electrostatics aren't designed for much under 300hz. Ideally, they're supplemented with a sealed enclosure subwoofer. Another mid/hi freq speaker/tweeter that supposedly has amazing sound is the plasma speaker. I'd just love to see one of these in person. Their only conventional downfall is the dispersion pattern (or lack thereof), but they're cool as hell! Who WOULDN'T want a bolt of lightning singing some Neil Diamond?!? Not bad AA, but I prefer this McIntosh amp: Pure badass! Yes, that's nice. Remove the cover, and it's basically two of the 75W monoblocks I posted, plus a couple of cool output meters. Bet you couldn't tell the difference just by listening. 375 Watts RMS each, class A operation, $25,000 each. These are said to be the best home hi-fi amps ever built. "Carver caused a stir in the industry in the mid-1980s when he challenged two high-end audio magazines to give him any audio amplifier at any price, and he’d duplicate its sound in one of his lower cost (and usually much more powerful) designs. Two magazines took him up on the challenge. First, The Audio Critic chose a Mark Levinson ML-2 which Bob acoustically copied (transfer function duplication) and sold as his M1.5t amplifier (the “t” stood for transfer function modified). In 1985, Stereophile magazine challenged Bob to copy a Conrad-Johnson Premier Five (the make and model was not named in the challenge but revealed later) amplifier at their offices in New Mexico within 48 hours. The Conrad Johnson amplifier was one of the most highly regarded amplifiers of its day, costing in excess of $12,000. Of note that in both cases, the challenging amplifier could only be treated as a “black box” and could not even have its lid removed. Nevertheless, Bob, using null difference testing, successfully copied the sound of the target amplifier and won the challenge. The Stereophile employees failed to pass a single blind test with their own equipment, and in their own listening room. 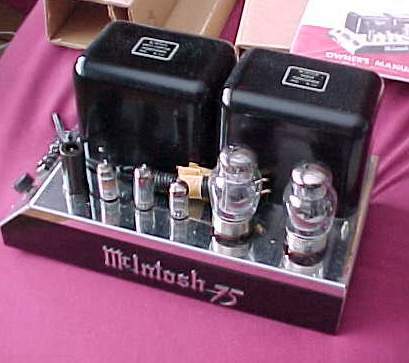 He marketed “t” versions of his amplifiers incorporating the sound of the Mark Levinson and Conrad Johnson designs which caused him some criticism by those who failed to understand the true nature of the challenge — that it was possible to duplicate an audio amplifier's sound in two completely dissimilar designs. 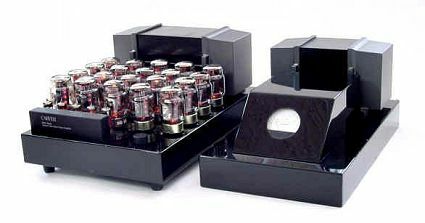 In light of this criticism, Bob Carver went on to design the Silver Seven, the most expensive and esoteric conventional amplifier up to that time and duplicated its sound in his M 4.0t and later models which sold for some 1/40th the price (around $600-$1500)." So basically, Mr. Carver tested and listened to various amplifiers, then created better versions with the same sonic character, at a lower price. Pretty awesome if you ask me. Pretty hard to find Carver stuff though, especially around here. Bryston is another audiophile amplifier company if you've got the bones for them. I've never personally heard one but I've heard of them in many hi end circles. First one may be nice, but I don't know if I believe that it has 200 watts per channel. It's way too skinny to be 200 watts, my Adcom is I think 80 watts per channel and it's at least twice the size of that thing. Never been a big fan of buying audio equipment off eBay. The shipping is what can really make it expensive, if you get a decent amp or whatever - it is going to be heavy and cost a lot to ship. Could still get damaged in shipping. If you look at the specs, the Carver is rated 80W x 2 @ 8 ohms, same as yours. And it weighs 22 lbs. How much does your Adcom weigh? The Carver may be smaller in size, but there's a lot more air in the Adcom. The Carver is built more densely. I believe it will deliver an honest 200W x 2 into 2 ohms, which is impressive. That means this amp has a good amount of dynamic headroom even with 8 ohm speakers = better SQ, better amplifier design, and better internal parts. My Adcom weighs about 25 lbs I think, maybe a bit less. Not sure exactly on the current draw, one part says "Power: 115 VAC 50-60 Hz" and underneath it it says "Power consumption (max): 720W".